Gerry's Kitchen has been up and running for almost one year now and so far I've had a lot of fun writing the blog and getting feedback from people who have visited the site. My initial reasons for putting the blog together was simply to pass on some recipes that I like to cook at home, as well as give feedback on some of the places that we enjoying eating from. However over the last year, I have been lucky enough to get chatting with food producers through farmers markets, Facebook & Twitter, and have published a number my '5 Questions' articles to help give a little insight into the fantastic people that are creating wonderful food in and around my local area. Things took a surprising turn when I was recently contacted by Mark Rennie from Belhaven Fruit Farm, asking if they could supply me with some samples of IceDelight in order for me to provide them with an honest Gerry's Kitchen review. In the name of research, I took Mark up on his offer and after a few tweets back and forth, we set a delivery date and time for Belhaven Fruit Farm to drop some samples off to me. Fat-Free, Dairy-Free, and Full of Fruit! Family run business, Belhaven Fruit Farm have been producing IceDelight since 2007. A fat free, dairy free, and gluten free dessert blended from home-grown Scottish fruit with an authentic Italian recipe to create a unique, luxuriously creamy dessert as healthy and tasty as real fruit. IceDelight started in 2007 when our fruit farm experienced a brilliant summer and we were left with a bumper crop of strawberries and raspberries. We set about making a fruity, fat-free dessert and even visited Tuscany to find out how authentic gelato was made. Returning from Italy bursting with ideas we set about making what eventually became IceDelight. What’s the best piece of business advice you could give? We believe that honesty is the best policy – we only use hand-grown, hand-picked fruit from our fruit farm and ethically sourced fruit when it’s not possible to grow our own. This way we can ensure the integrity of our product. Where would you like to see your business in 5 years time? We would like IceDelight to be available globally – the next year will hopefully see the product rolled out to supermarkets across the UK so in 5 years’ time what’s to stop us going multinational! The scientifically-proven health benefits of IceDelight are universal and we also think the warmer climates of other countries are perfect for enjoying a refreshing, fat-free, fruity dessert; something us Scots can but dream of at times! If you could only have one of your own products, what would it be & why? I would invite Richard Reed from Innocent Smoothie. The way in which they’ve conquered the smoothie market is inspirational. Of course, IceDelight for starters, main and dessert would be on the menu...maybe washed down with some Innocent Smoothie just so Richard didn’t get a complex. With all the running about that is done over the Christmas period, it wasn't until Hogmanay that myself and Nicola were able or dig our spoon into the samples that Mark had delivered to me. At this point, I'll mention that I'm not the biggest fan of ice-cream (but Nicola is), however in the name of research I persevered and plunged my spoon into the bowl. We had all five flavours to try, Raspberry, Strawberry, Blackcurrant, Lemon, and Gooseberry & Elderflower. 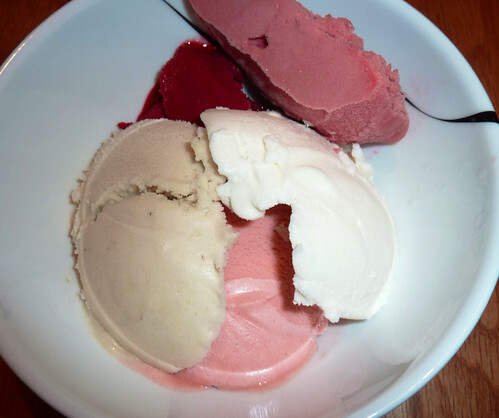 More like a sorbet than ice-cream, every flavour tasted exactly as the fruit pictured on the front of the tub. The raspberry and strawberry were packed with real berry flavour, the vivid purple blackcurrant (which was my favourite) reminded me of my Gran's homemade jam, the gooseberry & elderflower was sharp but well balanced, and the lemon (Nicola's favourite) was tangy and zesty. The thing that surprises me most about IceDelight is the fact that all these fruity flavours are fat free! In fact, researchers from Queen Margaret University in Edinburgh studied the possible health benefits to be had from eating IceDelight and the results were startling - the product kept all the vitamin and antioxidant properties of the real fruit and could even be counted as one of your 'five-a-day'. Whatever your favourite, each serving has less than 90 calories. Now available in farm-shops and delicatessens throughout Scotland, as well as a few select stockists across England. To find out if IceDelight is available near you, simply follow the link. 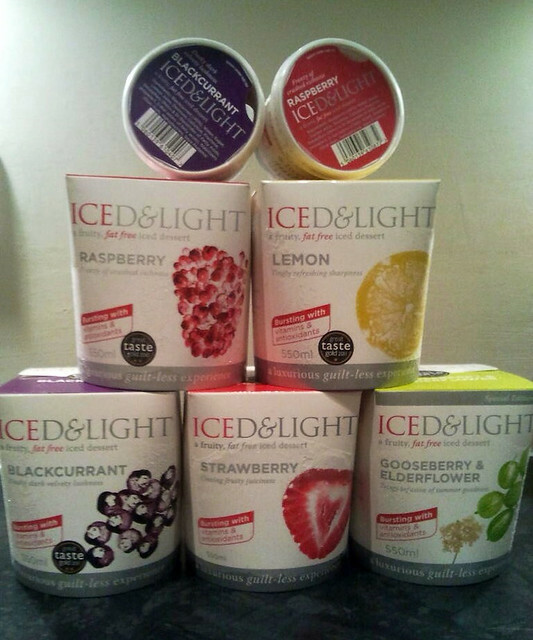 So to sum up, IceDelight is fruity, flavoursome, fat free, gluten free, packed with vitamins and anti-oxidants. in fact, a healthy dessert that everyone can enjoy. Keep up to date with IceDelight on Facebook and Twitter.